All is not roses in Guild Wars 2: Heart of Thorns. Community members are disgruntled, be that in relation to delayed or missing features, how loot is awarded or a perceived focus on the gem-buying players to the detriment of the rest. Hopefully news of the Spring Update will be a breath of fresh air, sweeping away cobwebs of resentment from April 19. It's hard to say of course, because the contents of said update are largely under wraps. Instead of the usual series of blogs in the run-up to a large update, ArenaNet president Mike O Brien has said, "I think our job is to delight you with what we ship, not with talk and promises." There will be changes to Fractals, including a revamp of the tiering system and associated achievements. Scribing costs are coming down, and Desert borderlands in WvW will be improved prior to the re-implementation of Alpine borderlands based on community feedback. 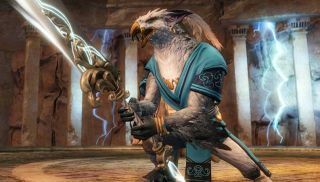 As a high-level guide to the expected WvW changes, ArenaNet says its priorities are: stability and skill balance, fix or revert desert borderlands, rewards, population balance and scoring.